ENCINITAS, CA--(Marketwired - February 29, 2016) - DMV.ORG, the nation's largest independent resource for DMV-related information and services, today announced its 2015 fourth-quarter Financial GiveBack donation of $25,000 to B.R.A.K.E.S., a 501(c)3 organization that provides free, advanced driver's education to teen drivers. 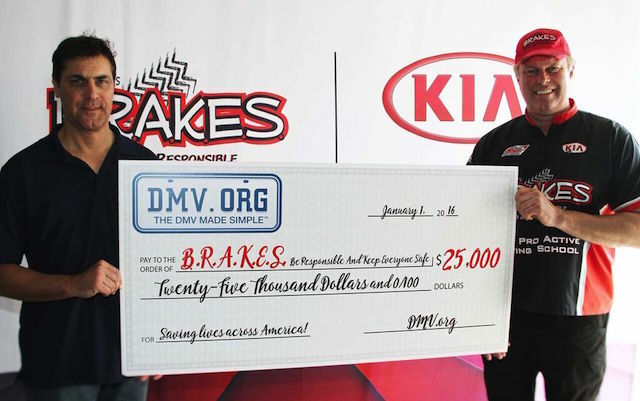 Bob Kurilko, President & Chief Operating Officer at DMV.ORG, and DMV.ORG team members presented the $25,000 check to Doug Herbert, the founder of B.R.A.K.E.S., on Saturday, February 27, 2016 at B.R.A.K.E.S.' Teen Pro-Active Driving School event in Pomona, CA. B.R.A.K.E.S. has held over 20 events in Pomona to date. This event saw almost 150 teen drivers get behind the wheel to learn hands-on, advanced defensive driving techniques on a closed course. "We are grateful to be the recipients of the 2015 Financial Giveback allocation of $25,000. We have earmarked a portion of this money in our 2016 plan to create a training and certification for our B.R.A.K.E.S. instructors to deliver the B.R.A.K.E.S. mission and message to the teenagers and parents attending the training," said Herbert. He added, "We are excited to have the DMV.ORG Impact Team at Pomona to experience firsthand how our driver's education course affects teens and parents alike." Kurilko said, "Car accidents are the number one killer among teens ages 15 through 19. Doug and the B.R.A.K.E.S. team help save the lives of teenage drivers every time they hold one of their Teen Pro-Active Driving School events. We enthusiastically support B.R.A.K.E.S. and their mission of safe driving." 1) Local GiveBack: A quarterly event that engages the DMV.ORG team with a local San Diego county charity with the aim to make a difference in the community. 2) Financial GiveBack: A biannual donation to nonprofit organizations dedicated to creating positive social change in the domain of transportation, including organizations whose mission it is to eliminate distracted driving or to provide free hands-on driver's training such as the training B.R.A.K.E.S. provides. 3) Online GiveBack: An initiative that leverages DMV.ORG's large web and social media presence to bring greater awareness to, and make a difference on, high impact issues that affect all of us. B.R.A.K.E.S. will be holding a Teen Pro-Active Driving School event at Qualcomm Stadium in San Diego on July 30 and 31. To learn more about B.R.A.K.E.S.' safe-driving program or how you can you can get involved with B.R.A.K.E.S., visit https://putonthebrakes.org/. Bob Kurilko, President & Chief Operating Officer at DMV.ORG, presents the $25,000 check to Doug Herbert, the founder of B.R.A.K.E.S.